Makry Gialos (Μακρύ Γιαλός) is one of the less-appreciated tourist destinations in Crete. It's a pity, because unlike those located on the north coast, it is here that we can enjoy the full tourist infrastructure and a good sandy beach, without sacrificing peace. In the middle of the last century Makry Gialos resembled one of many towns located in the south of Crete. A small fishing village was concentrated around the bay creating a natural harbor here. This situation changed only in the 1950s, when an asphalt road was brought to this place from Ierapetra . From that moment, Makry Gialos recorded strong growth and eventually became one of the most important tourist centers located in this region of Crete. Today, tourists who use the services of travel agencies as well as people who organize their stay are willing to come here. A special curiosity is the fact that Makry Gialos is also a place where Cretans willing to relax from the hustle and bustle of Heraklion are happy to spend their holidays. However, modern dynamic development does not mean that human activity in this place is limited only to the last few decades. The first excavations carried out here only from 1971 revealed a number of remnants proving that already in the Minoan era in the present Makry Gialos there was a developed settlement. Thanks to subsequent excavations, which began in 1977, archaeologists managed to discover the remains of a Roman villa, which was most probably used from the third century BC until the first century AD At present, work in this position is still not completed, so making far-reaching conclusions is not possible . It is only known that this house was built with the use of expensive materials and had all the facilities typical for that period - it is worth mentioning, for example, a bath or a central heating system called hypocaustum. Unfortunately, relatively few artifacts constituting personal belongings of the inhabitants and old home furnishings were discovered in the area of ​​the excavations. The most likely explanation for this situation is that the area of ​​the existing excavations has been stripped over the centuries by pirates and self-proclaimed treasure hunters. In this place you will also find an ATM, as well as a branch of the Greek post office. Most hotels offer free internet access via WiFi. Of course, you can not forget about the large number of taverns, the vast majority of which is located near the port side of the coast. 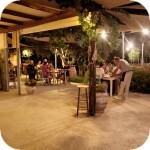 They offer a full selection of dishes typical of Cretan cuisine. The fact that most of them serve delicious dishes let it testify that in the evenings they fill up with guests and in some of them it can be hard to get a free table. We, from our own experience, can recommend you the tavern Agyrovoli. Two Greek words that form the name of this village give some idea of ​​its appearance. The Macro member (Μακρύ) means long, while Gialos (Γιαλός) means the wordseashore. In fact, as for the Cretan standards, the place can boast of the name of the long and sandy coast. The main beach called by the local Hania or Long Beach (long beach) is located next to a small port and stretches along the coast of the central part of the village. This place is characterized by a fully sandy bottom, whose great advantage is also the fact that it falls very gently and slowly. Even at a relatively large distance from the shore, the water is still not very deep. This beach can be quietly recommended for families who spend holidays with smaller children. Further beaches available from Makry Gialos are already located within Analipsi. Some of them are eagerly crowded with guests spending their stay in large hotel facilities located east of Makry Gialos. Due to the terrain and the fact that the coast is separated by a hotel area, these beaches seem to be inaccessible to tourists from outside. Although Makry Gialos can be perceived by some as a typical tourist destination, in our case it met 100% (and maybe even more) of the demands placed on it. We loved the slightly less formal relaxed atmosphere on the main beach and the large and honest hospitality of all the Cretans we met here. The vast majority of people relaxing here are those who organize their leisure alone. Hardly anyone rests here in the rhythm of meals issued in hotels, so even in the afternoon hours there is no effect of "extinction" of beaches. Unfortunately, if we finish our description on this, it will not be full and truthful. Over the many years of tourism development, modern Makry Gialos has grown with the neighboring town of Analipsi. Walking along the main road running parallel to the coast, it is difficult to set a border between them. The location of this town in the extreme eastern part of the island is a perfect excuse to visit two major cities located in this region. Access to both Ierapetra and Sitia is possible by using the KTEL bus. There are several courses available each day to both cities. If you like hiking it is an interesting trip to the Pefki ravine. The start of a relatively straight trail, about 4.5 km long, is located south of Makry Gialos and is easily accessible to tourists. Not far from Makry Gialos, the route leads through the Orino gorge. In the spring you can find picturesque waterfalls on the trail, which, however, dry up to summer. Unfortunately, this place is notit is too popular among tourists. We have not met anyone on this route. Organizing a separate trip will also require a trip to the Pervolakia Gorge located on the east of Makry Gialos. One of the peculiarities of this place is the unusual monastery of Moni Kapsa, whose white buildings seem to grow out of steep rock walls. A good idea is a cruise on Koufonissi. It is a full-day trip, during which tourists have the opportunity to relax on two of the 36 beaches on this island. A more detailed description can be found in our separate article: Cruise to the island of Koufonissi . Makry Gialos is one of the largest eastern Cretan towns on the east. Getting to it is relatively easy and not very complicated. Coming from the central part of Crete, follow the signs for Heraklion, Agios Nikolaos and then Ierapetra. When you reach the last place, all you need to do is look for further direction indicators that will guide you towards the east. From this point, Makry Gialos is only half an hour away by car and less than 25 kilometers. Makry Gialos is also a pretty good choice for people who want to take a KTEL bus here. Based on our own experience, we can write that the problem is not even access from the airport in Heraklion . The relatively large number of connections made from this place to Agios Nikolaos and to Ierapetra definitely facilitate planning a trip. The only inconvenience may be the need to make 1-2 transfers. Margarites at every step does not let you forget about what the inhabitants live with. Even trees seem to bear here pots that hang picturesquely from branches. It is in this peculiar way that one of the craft workshops advertises its products. After visiting the Margarites, our luggage was enriched by a good few kilos of pottery. Although products from this village can be bought practically all over Crete, it is only here that you will find less-known, though equally beautiful, patterns. Despite its popularity, Margarites has preserved its authentic Greek atmosphere, so it is worth taking a walk along the main street, which is simply flooded with local potter's products.